Coachella 2014 has already had its share of surprises: Reunited Outkast had Janelle Monae as a surprise guest, and Girl Talk brought out Too $hort, Busta Rhymes, Juicy J and E-40 Friday night. And on Saturday night, audiences in attendance were treated to a rare appearance when Beyoncé crashed little sister Solange's set. The singer took the Gobi stage at 8:25 to perform an hour long set, performing a cover of Erykah Badu’s “Bag Lady”, only to be interrupted moments later when big sister Bey jumped on stage and started rocking out with Solange to her track, "Losing You". 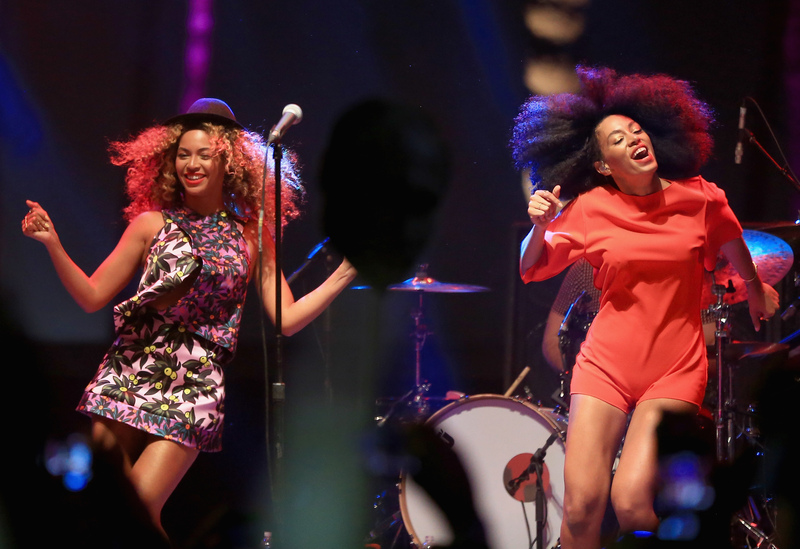 The pair danced in fiercely choreographed moves on stage, both wearing bright colored dresses and donning wild hair. Sadly, the 32-year-old performer didn't join her little sis in a song, but the pairs rehearsed dance moves were enough to excite any fangirl to screams. The duo ended their dance in an adorable embrace. The 32-year-old "Who Run the World (Girls)" singer was seen earlier in the day enjoying some of the festivals performances, notably Capital Cities and Cage the Elephant, who she met up with backstage. The same night, Pharrell Williams had several guests on stage, including the legendary Gwen Stefani. The pair performed Stefani's popular "Holler Back Girl" with a gaggle of backup dancers lighting up the stage. Ironically, Jay Z, Beyonce's hubby, showed up to perform at Nas' set. Apparently, their feuding days are long behind them.